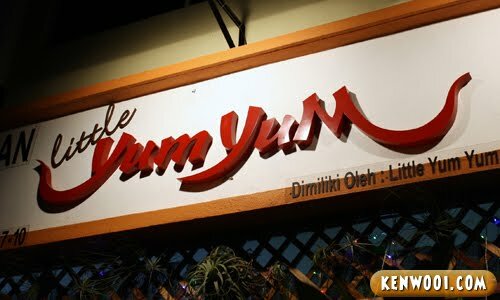 Being born and raised in Ipoh, my parents used to bring us to this local restaurant called Yum Yum. Now that I’m away from Ipoh and Yum Yum has expanded to Kota Damansara, I was invited to have dinner at their newly opened outlet. They call it – Little Yum Yum. Unlike the first double-storey Yum Yum outlet in Ipoh, Kota Damansara’s Little Yum Yum is, well… little – with only one-storey. Despite that, the environment was pretty much homely with distinguish Nyonya decorations. Now, let’s go on to the food that was served. 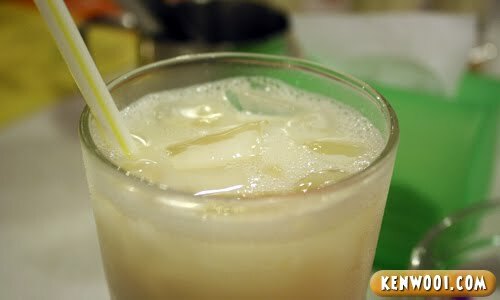 For the drink, we were served with soya bean. This soya bean drink doesn’t taste like the typical ones. Since it’s homemade and the owner insists on not adding preservatives, a little salt was added so that it can retain its freshness. Therefore, it could taste a little salty. 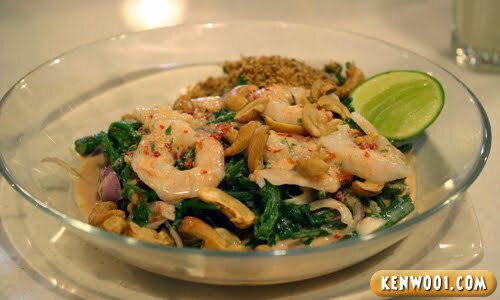 For the appetizer, the Kerabu Paku with Prawn and Cashew Nut was served. Small RM14, Large RM28. 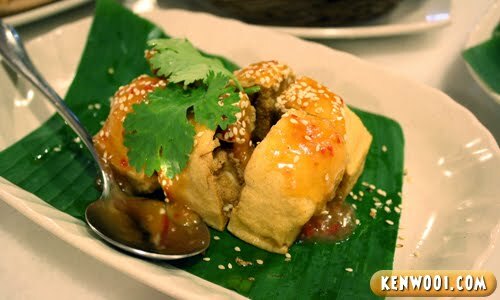 The mixture of milk, sambal belacan and the combination of the ingredients make this dish stands out amongst the common appetizers. It’s creamy yet not excessively rich. With the starter done, the main courses come next. The first one is Vietnamese Mix Seafood. Small RM18, Large RM30. I don’t really fancy petai but these petai weren’t that bad. 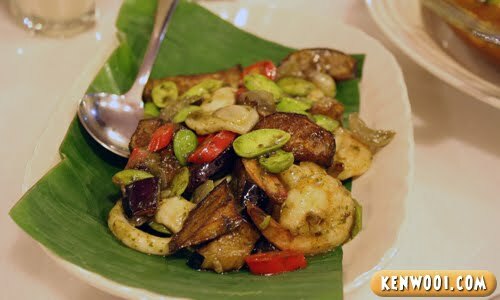 The other ingredients such as the prawns, brinjal and squids were appealing as well. Yum Yum’s Special Fried Tofu was next. Small RM7, Large RM13. Topped with plum sauce, the outer layer is crunchy while the inside is soft and juicy. Next, Yum Yum’s Special Pandan Chicken. RM3.80 per piece. This has got to be my favourite dish. 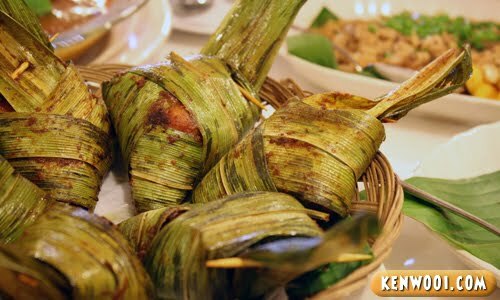 Marinated with herbs and spices, and wrapped with pandan leaves, these boneless chicken are certainly delicious. 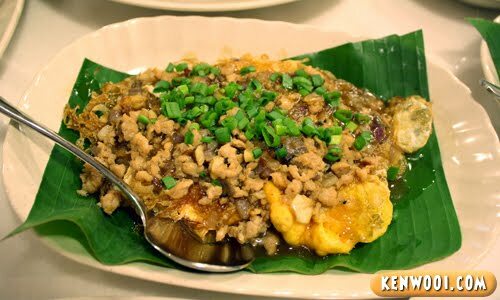 Then, we had Baby Kai Lan with Salted Fish. Small RM9, Large RM16. 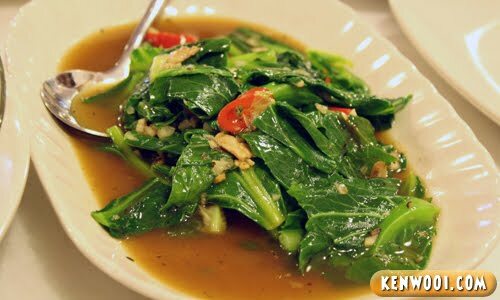 The texture of the vegetable has a minor crunchiness and the salted fish gave it an extra sense of flavour. Another main course served was Nyonya Gulai Tumis. Chinese Promfret RM90-RM130/kg, Fish Cutlet RM60-RM120/kg. This dish is generally known as a spicy one. 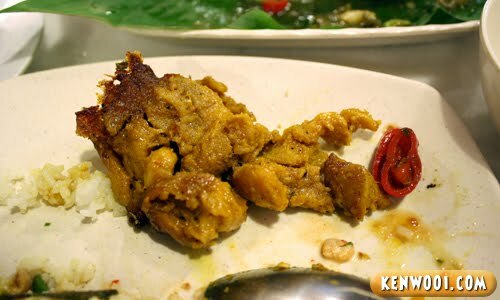 However, Little Yum Yum’s Gulai Tumis is not too spicy – which is a good thing for those who can’t stand spiciness. The fish is definitely fresh. Then, Yum Yum Special Thai Style Egg. Small RM9, Large RM15. Lastly, Kerabu Mango with Fried Cuttlefish. Small RM9, Large RM16. 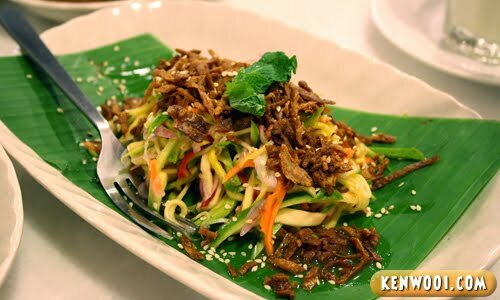 The flavour of this Kerabu blended well. It’s quite appetizing and the mango flavour is prominent. After the main courses, it’s time for desserts! 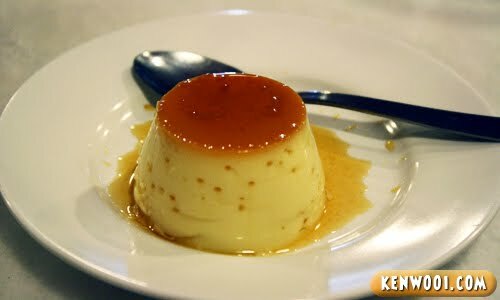 The first one served was Creme Camarel Pudding. It’s soft, nice and melts in the mouth! Simply luscious. Another dessert was the Red Ruby. 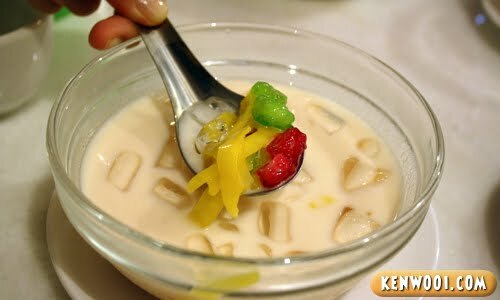 Made from slices of jack-fruit and coloured water chestnut, this dessert definitely deserves a thumbs up! Delightful. And yeah anyway, the best thing about this restaurant is that – it’s Halal! 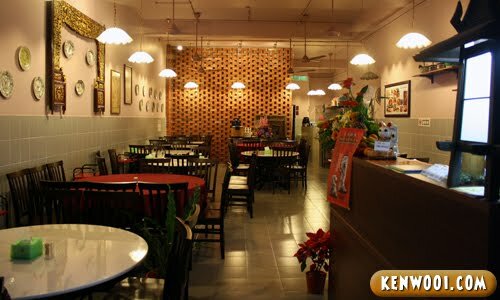 Oh..I must visit Yum Yum in Ipoh soon..
the price~~ macam higher bit..
where is YUM YUM in Ipoh ? although it’s look so so.. but is so tasty!! thanks for the last caption.. it’s a bit pricey but the ambiance is great i guest.. will definitely give it a try soon! looks good, and seems luxurious as well. shall visit one day since it’s quite near my place! hehe..thanks for sharing. oooh.. nice review.. looks yummy! must try that when i get back! your picture make me hungry la..
totally malaysian food ~ ! looks yummy but i doubt the halal thing when i see that board lorhhh..
erm.. which board is that? the last one? 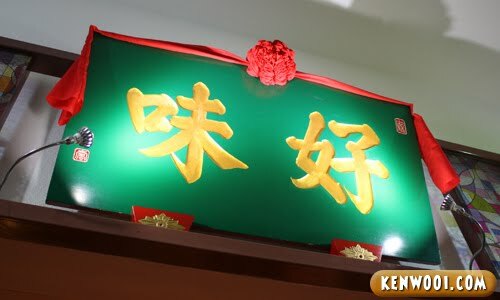 The chinese board character definately means the owner is a Chinese but it doesn’t mean is not Halal. you can always call them out to check. Acording to my understanding, they have a Halal Cert. I been there makan once. The foods is good and reasonable price! wow.. a little pricey for the pandan chicken.. at RM3.80 per piece??! look yummy i like it alot !! I had went to their restaurant last night, that was a pleasant dinner for me, everything are so nice and delicious!! suituapui, u should go and try first then give a comment!! they gulai tumis is the best i ever had! 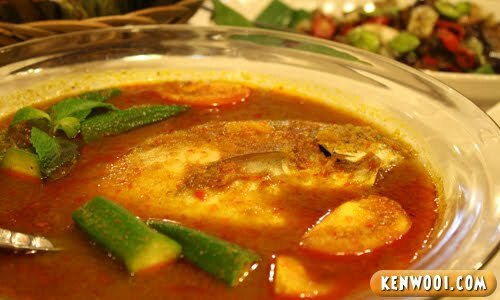 I am sure after that u will know how to diffirent in between what is assam pedas and what is gulai timis! !